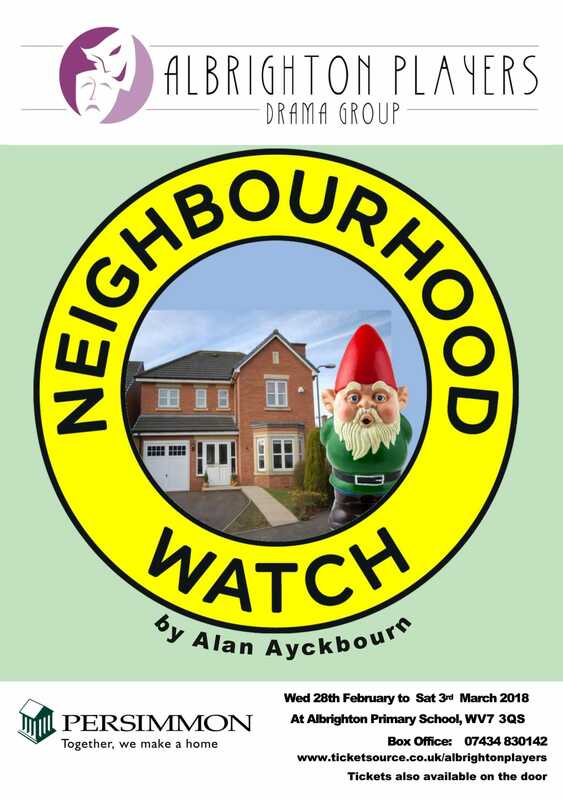 Don’t worry we haven’t branched out into community security, instead it is the title of our next production, Neighbourhood Watch by Alan Ayckbourn. We will be performing this on Wednesday 28th Feb, Thursday 1st March, Friday 2nd March and Saturday 3rd March at Albrighton Primary School. Tickets are £8 for adults and £7 for concessions and you can buy them here. Early booking is essential as this play is in the round which means you are right up close with the actors and seating is limited. Brother and sister Martin and Hilda Massie live together, leading a quiet, Christian existence in the confines of the Bluebell Hill Development. Just as they are preparing for a housewarming gathering, their peace is shattered by a young trespasser in their garden. The Massies’ neighbours congregate in their living room and together they agree to form a neighbourhood watch group to safeguard against further incidents. What begins as a well intentioned scheme for a safe community ends up unravelling relationships all over the estate. A delightful mix of hilarity and drama make this a funny and thought –provoking production.